St Ignatius was born into a peasant family at Laconi, Italy. In his youth, he became seriously ill and vowed, that if cured, he would join a religious order. St Ignatius recovered, but dithered about joining the order! Later, after a riding accident, his life was again in great danger and he again made the same vow, in prayer to St Francis of Assisi. 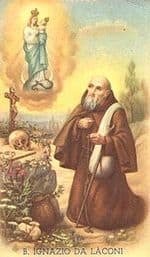 St Ignatius joined the Capuchin Friars, although, because of his continued poor health and frail nature, they were hesitant at first. St Ignatius spent the remainder of his long life in prayer and penance and doing the general chores as required of him by his superiors. One of his duties was to collect daily alms for the upkeep of his community. He did so out of duty, with a reverence that reaped much respect among the townsfolk. Even after he lost his eyesight, he continued his daily collections. His Feast Day is the 11th May, the day of his death. Pray for us that we will live up to our life promises.